- City ordinance prohibits the use of Fireworks in the City of Tacoma - including on New Years Eve. Violators of the fireworks law are subject to a $257 dollar fine and the confiscation of their fireworks. - Please celebrate responsibly (no drinking and driving). From our TFD family to yours, have a safe and healthy New Years and we look forward to serving in 2010. Narrative: At 11:33 a.m. Tuesday December 29th, 2009 5 companies of Tacoma Firefighters - 2 Engines, 2 Medic Units and the Fire Boat Commencement responded to the Owen Beach Area of Point Defiance Park for a person who had fallen down the cliff. First arriving companies found one patient next to the water on the beach. Due to the remoteness of the patients location, the assistance of a nearby fishing boat was secured and the patient was transferred to the Vashon Ferry Dock area and then transported to a local area hospital. Now that Christmas is over, TFD would like to remind you of the City of Tacoma's convenient and safe way to dispose of your tree. Never burn your tree in your fireplace or yard. Solid Waste Management encourages you to cut your Christmas tree (unflocked, undecorated) in small enough sections to fit inside your yard waste container so the lid closes flat. If you’re unable to fit your tree inside the container, and you are a City of Tacoma resident, the City of Tacoma will pick up your tree at no additional charge from Jan. 11 to Jan. 22. • Remove all decorations and tinsel. • Dispose of flocked trees in the garbage or at the landfill. • Take tree out of the stand. • Cut into lengths no longer than three feet and bundle with heavy twine. • Place in container or in front of the curb. A different truck will come along to pick up bundled trees only. Please note that Christmas trees are the only exception to the utility’s rule that no separate bundles are allowed outside of containers. Single-family residents may recycle their clean, unflocked trees at the Tacoma Landfill (3510 S. Mullen St.) now through Jan. 24. The landfill is open from 8 a.m. to 6 p.m. daily (closed New Year’s Day). For more information on Christmas tree recycling within the City of Tacoma, call (253) 591-5543. Go to piercecountywa.org/treecycle for information on tree recycling outside the City of Tacoma. Narrative: At 12:02 p.m. Monday December 28, 2009 4 companies of Tacoma Firefighters – 2 Engines (one with the Spill Containment Unit), 1 Ladder and 1 Medic Unit responded to the area of Frank Albert Road E and North Levee Rd E in Fife for an overturned diesel fuel truck. First arriving companies found a fuel truck carrying approximately 1,200 gallons of diesel fuel had rolled down the side of the levee on the river side of the road. Crews transported one patient (the driver) to a local area hospital. The vehicle is now in the process of being up righted so that th e fuel can be transferred to another tanker before being towed. There is no fuel leaking at this time. Tacoma firefighter/paramedic Mike Ferguson was awarded the Coast Guard Public Service Award for his actions in which he rescued four boaters, including two children, from a potentially deadly situation. On Wednesday December 16th, Ferguson attended a ceremony at the Coast Guard's Port Angeles station, at which he was given the award. His dedication and commitment to helping others in need proved to be the difference between life and death. For the past 20 years, Tacoma Firefighters have brought holiday cheer to the lives of thousands of Tacoma children and their families with deliveries of food, clothing and gifts just before Christmas. This year, firefighters have raised over $14,000 dollars to help more than 140 children and families in need. “It’s always a great honor to help bring a little happiness to those less fortunate during the holidays,” said project co-founder Lieutenant Jim Lee (other co-founders include Lieutenant Andrea Schroeder and Firefighter Ron Ernst). This year’s contributors include active and retired Tacoma Firefighters, Tacoma Professional Firefighters Local #31, The Tacoma Fire Department and the Office of the Pierce County Council. Special deliveries from a fire engine, medic unit and Santa Claus are scheduled to start on Dec. 19 through Dec. 21. This year’s recipients were identified through the Tacoma School District Head Start Program, YWCA Women’s Shelter, the Sharing House and Mary Bridge Children’s Hospital. For additional information regarding this event, contact Lieutenant Jim Lee at (253) 381-0851. During this record breaking cold weather streak, Tacoma Fire Department (TFD) has responded to nearly 20 calls a day for bursting water pipes and water related problems. As the water in pipes freezes it expands - causing the pipes to crack or burst. You won’t often know there is a problem until the temperatures warm enough to melt the ice and allow for water to flow. If you are experiencing the unfortunate dilemma of frozen or busted water pipes – here are a few things you need to know. • Most importantly, know where and how to shut off your main water supply before you have a problem. There should be a main valve for your house (usually located in the basement or crawl space) and one at the water meter pit. • The pipes that freeze most frequently are those that are exposed to severe cold, such as outdoor hose bibs, swimming pool supply lines, water sprinkler lines and water supply pipes in unheated interior areas such as basements and crawl spaces, attics, garages or kitchen cabinets. Pipes that run against exterior walls that have little or no insulation are also subject to freezing. • Make sure pipes located in exterior walls, or in floors over unheated spaces (such as a bathroom above an attached garage) are insulated and protected. Keep your garage door closed. • Remember to never use an open flame torch (fire danger) or boiling water (will cause the pipes to burst) when thawing pipes. A hair drier on low setting works well. • Select a licenced plumber to assist you in making any necessary repairs. • Make sure that any exterior piping is insulated and hose bib’s are covered. • Increase the building temperature to prevent freezing (particularly warehouses – storage facilities). • Fire Sprinkler systems that go out of service require you to institute a Fire Watch until the system is operable. Incident Location: 5034 S “G” St. Narrative: At 2:18 p.m. Tuesday December 8th 2009, 7 companies of Tacoma and Puyallup Firefighters – 4 Engines, 2 Ladder Companies (1 from Puyallup) 1 Medic Unit and 2 Battalion Chiefs responded to a reported residential structure fire at 5034 S. “G” Street. The first arriving units found heavy smoke and flames showing from the second floor apartment of the two story, two unit residence. 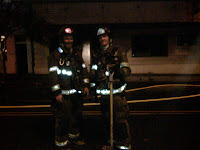 Crews attacked the fire with hand lines, conducted primary search and rescue and contained the fire to the upper unit. The occupants of the building (4 adults) escaped unharmed and are receiving relocation assistance from the Red Cross. Each year fires occurring during the holiday season injure 2,600 individuals and cause over $930 million dollars in damage nationally. Tacoma Fire Department (TFD) reminds you to remember these simple life-saving steps you can take to ensure a safe and happy holiday season. - December is the peak month for candle fires. - Always use candle sticks or non flammable holders. - Extinguish all candles when leaving the room or going to sleep. 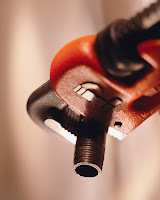 - Cords and plugs are the leading type of equipment involved in the ignition of Christmas trees. - Any string lights with worn, frayed or broken cords or loose bulbs should not be used. - Always unplug tree lights before leaving home or going to sleep. - Unattended cooking is the leading cause of home fires in the U.S..
- When cooking for holiday visitors, remember to keep an eye on the range. - If you must leave the kitchen while preparing food, set a timer or carry a pot holder to remind you that food is cooking. 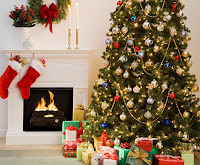 - Keep your tree away from fireplaces, portable and baseboard heaters. - Try to keep fresh cut trees as moist as possible by giving them plenty of water each day. that needles are falling and the color is fading. Narrative: At 8.32 a.m. Wednesday December 3rd 2009, Tacoma Fire Department (TFD) and Central Pierce Fire and Rescue (CPFR) units responded to a reported body in the water in the Puyallup River. First arriving units confirmed that there was an unidentified body lodged in a wooden snag area approximately 15 feet from the bank. CPFR Swift Water Rescue Team and the Pierce County Sheriff's Department Dive Team were called to recover the body during this multi-jurisdictional response. Fife Police Department continues as the lead agency for this incident and will release any additional details as they become available. 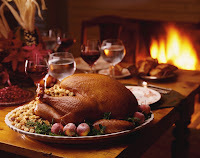 Thanksgiving is the peek day for home cooking fires across the nation. 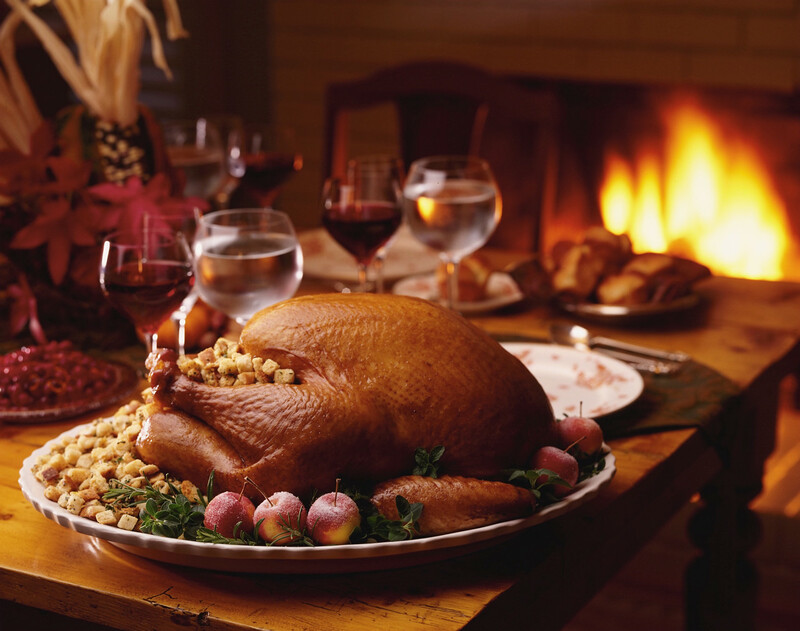 According to the National Fire Protection Association, U.S. firefighters responded to roughly 1,300 home fires involving cooking equipment on Thanksgiving 2007. The Tacoma Fire Department (TFD) would like to encourage you to add the following cooking safety tips to your Thanksgiving recipes this holiday. • Never leave cooking food unattended. • Keep all combustibles away from the cooking devices. • Keep children away from the cooking areas to reduce the risk of burns and fires. • Do not wear clothing with loose sleeves while cooking. • Ensure that you have a fire extinguisher and a working smoke alarm on each level of your home. • Remember to handle, prepare and cook food safely. Finally, check out the following information from the Underwriters Laboratory regarding deep fat frying turkeys and turkey fryers. There are so many hazards related to these devices, the UL won’t certify any turkey fryers for use and TFD strongly recommends you do not use them. Narrative: At 10:17 a.m. Thursday November 19th 2009, Tacoma Fire Department (TFD) responded to a reported vehicle over an embankment in the Herron Ridge area off of Marine View Drive in North East Tacoma. After assessing the location of the vehicle, the first arriving companies quickly called for a technical rescue operation. Approximately 21 firefighters and command staff conducted a High-Angle Rope Rescue (due to the very steep slope) using a Stokes Stretcher to rescue one patient from the vehicle. The patient was transported to a local area hospital. According to the National Fire Protection Association home heating equipment is a leading cause of home fires during the months of December, January and February, In fact in 2006, heating equipment was involved in an estimated 64,100 reported U.S. home structure fires, with associated losses of 540 civilian deaths, 1,400 civilian injuries, and $943 million in direct property damage. Given these sobering statistics, the Tacoma Fire Department encourages you to check your heating systems and watch how you heat as winter approaches. Make sure your fireplace and wood stove have a clean chimney. Remember, keep combustibles three feet from the heat. An annual inspection is key. Never use a barbecue indoors for heating due to winter storms and extended power outages. Narrative: At 6:04 a.m. Thursday October 29th 2009, 7 companies of Tacoma Firefighters – 5 Engines, 1 Ladder, and 1 Medic Unit responded to a reported residential structure fire at 2329 South “L” Street. The first arriving units found smoke and flames showing from a second floor bedroom. Crews attacked the fire with hand lines, conducted primary search and rescue and used a Thermal Imaging Camera to check for fire extension and hot spots once they had the main fire contained. The occupants (2 adults & 4 children) escaped unharmed and the cause of the fire is currently under investigation. UPDATE: Fire investigators have determined that the cause of the fire was a curling iron next to combustible materials, resulting in an estimated $75,000 damage to the building and its contents. Tacoma Fire Department would like to remind everyone to take a few moments to replace the batteries in your smoke alarms this weekend. Smoke alarms most often fail because of missing, dead or disconnected batteries, so maintenance is a simple and effective way to protect your family and reduce home fire deaths. According to the Washington State Fire Marshal, 82 percent of fire deaths in our State occur in homes without working smoke alarms and the peak time for home fire fatalities is between 10 p.m. and 6 a.m. - when most families are sleeping. For best protection, it is recommended that people install alarms utilizing both (ionization and photoelectric) technology and ones that have long life 10 year lithium ion batteries. Visit the United States Fire Administration and National Fire Protection Association for additional information regarding smoke alarm types, installation, maintenance and safety. *The proper use of marine-approved cord sets. *Smoke Alarms and CO2 detectors. *The proper use of portable Fire Extinguishers. *General Fire and Life safety precautions. The Fire Boat Commencement was also on scene and provided tours of one of our most unique pieces of firefighting equipment. Visit the US Coast Guard for additional information about boating safety. UPDATE: Fire Investigators have concluded that the cause of today's fire at the Teamsters Hall & Offices at 220 S. 27th St. is undetermined. The damage estimates for the building and contents is approximately $80,000. Incident Location: 220 S. 27th St. Narrative: At 2:57 a.m. Tuesday October 20, 2009, 9 companies of Tacoma Firefighters - 5 Engines, 2 Ladders and 2 Medic Units responded to a reported commercial l structure fire at 220 S. 27th Street. 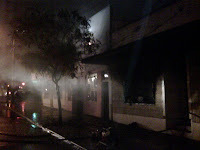 The first arriving units found heavy smoke and fire showing from the first floor of the local Teamsters Hall & Offices. Crews attacked the fire with hand lines, conducted primary search procedures and checked for fire extension into the second floor of the building. The cause of the fire is currently under investigation and there were no injuries to report. Narrative: Tacoma Fire Department responded with 35 personnel to the report of fire and smoke at 306 East 26th Street on both floor 1 and floor 2. . First arriving companies encountered heavy smoke and fire conditions in a 50 foot by 100 foot business/apartment occupancy. Fire crews battled diligently to extinguish the blaze and ensure there were no occupants in the business and apartment dwelling. The blaze was contained just after midnight with no reported injuries. Training Update: Members of the Tacoma Fire Department participated in a valuable vehicle extrication training exercise this week. The purpose of this training was to enhance our ability to remove people trapped in vehicles at the scene of motor vehicle crashes. The training included scene safety, basic vehicle stabilization, tool proficiency and numerous extrication exercises. The skills practiced during these drills increases our firefighters level of readiness for this type of low frequency/high risk response. This past weekend, well over 1,000 people attended Fire Station Open Houses in honor of National Fire Prevention Week and learned how to perform the life saving skill of CPR at our mass training classes on CPR Sunday at the Tacoma Elks Club. We appreciated that so many of you stopped by to visit your neighborhood fire station and learn about fire safety. Congratulations to all of you who completed the CPR training (over 550 registered) - you now know how to use an Automatic External Defibrillator and can perform CPR! Thanks for helping make our community safer. 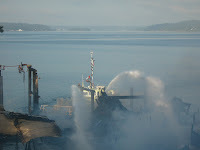 Narrative: At 5:19 a.m. Friday October 9th 2009, the Tacoma Fire Department (TFD) responded to a mutual aid call for a marina fire at Steilacoom Marina at Saltar’s point. The facility housed several non operative boats and suffered extensive damage. The crews from Fire Boat Defiance assisted in the attack from the water side as well as protected an adjacent pier. The Tacoma Fire Department (TFD) Technical Rescue Team provided an informative demonstration of a High Angle/Stokes Stretcher/Patient Rescue at the 58th Annual Governor’s Industrial Safety and Health Conference held today at the Greater Tacoma Convention and Trade Center. The conference is one of the largest in the nation, featuring dozens of workshops and the latest technology and product exhibits. 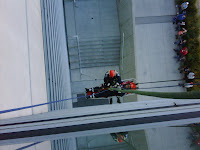 Tech rescue crews simulated rescuing an injured window washer who was hanging precariously from the side of the convention center - approximately 45 feet above 15th Street. The conference participants enjoyed the demonstration and were impressed by the technical skills and professionalism displayed by the team. Tacoma Fire Department Hosts Open Houses! Residents of Tacoma and Fircrest can celebrate Fire Prevention Week by visiting six neighborhood fire stations from 1-4 pm this Saturday, October 10th. This year’s theme, “Stay Fire Smart – Don’t Get Burned” encourages everyone to team up and spread the message that fire safety saves lives! Equipment will be on display and firefighters will answer questions about escape planning, fire safety and disaster preparedness. For more information on the activities hosted at each station, call the Tacoma Fire Department Fire Prevention Bureau at 591-5740. CPR Sunday is a free community training being held this Sunday October 11, 2009 at the Tacoma Elks Club. Classroom presentations include information about 911, patient assessment, Cardio Pulmonary Resuscitation (CPR) and Automatic External Defibrillators (AED's). Instructors will also utilize CPR Manikins and AED's to provide students with an opportunity to practice their classroom learning. In the last 9 years, over 4,000 participants have attended this valuable safety class. Our instructors are certified Basic Life Support (CPR) Instructors. For additional information about CPR Sunday and to register for the class visit CPRSUNDAY. Tacoma Fire Department would like to remind you that next week, October 4-10th, is National Fire Prevention Week. This years theme is "Stay Fire Smart - Don't Get Burned". Check out the following video for some great tips on how you can prevent fires and avoid getting burn injuries. For more information about Fire Prevention Week visit the National Fire Protection Association and as always - be sure to check the batteries in your smoke alarms and make sure they are in working condition. Narrative: At 6: 51 a.m. Monday, September 21st 2009, Tacoma Fire Department (TFD) responded to a reported structure fire at 6505 Pacific Hwy East Fife, WA 98424. The first arriving units found a 2 story boarded up abandoned house with smoke and flames showing from the upstairs area. After crews initial investigation, a defensive firefighting mode was established due to the deterioration of the building and the heavy fire load. Approximately 20 firefighters extinguished the fire and there were no injuries to report. September is National Campus Fire Safety Month and Tacoma Fire Department would like to remind everyone about this important safety topic. According to the U.S. Department of Education, there are approximately 18 million students enrolled in over 4000 colleges and universities across the country. Approximately 2/3 of the students live in off-campus housing. In other words, the same factors contributing to all fire fatalities, apply to college students as well. Make an informed decision about your housing - especially if you’re living off campus. For more information about prevention strategies and questions to ask about your living arrangements visit igot2know.org or USFA - fire safety for college students. Narrative: At 12:50 p.m. Friday, September 9th, the Tacoma Fire Department (TFD) responded to reports of a car fire at 1101 Tacoma Ave S. Responding fire units reported a large column of black smoke from a distance and arrived to find a late model conversion van fully engulfed in flames. 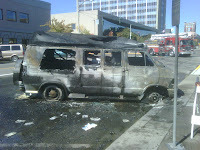 The owner of the van stated that he noticed smoke coming from the vehicle when he parked. After getting out to inspect, he discovered that his vehicle was on fire. Nearby business owners assisted in attempting to extinguish the fire. The owner stated that his vehicle's transmission had recently been repaired. There were no reported injuries. Tacoma Fire Department would like to thank all of the citizens and first responders who attended our September 11th Remembrance Ceremony. Tacoma Fire Department (TFD) and Firefighters Local 31 will host its Annual September 11th Remembrance Ceremony at 9:00 a.m. (prelude begins at 8:45) at the Tacoma Firefighters Memorial located at 3301 Ruston Way, Tacoma WA. This event will be part of a nationwide salute to firefighters, police, EMS workers and civilians who lost their lives that day. The ceremony will include comments from the Mayor of the City of Tacoma Bill Baarsma, TFD Deputy Chief Jolene Davis and TFD retired Battalion Chief Dave Jackson, as well as performances by the Honor Guard and Pipes and Drums. Join us as the Nations keep its' solemn vow "We have not forgotten". Narrative: At 8:29 p.m. Friday August 28th, the Tacoma Fire Department (TFD) responded to a reported apartment fire at 518 S. 7th St. The first arriving company reported they could see smoke coming from a second story window in a six story apartment building. Firefighters extended a hose line to the second floor to attack the fire while other crews began searching for possible trapped occupants. One person was rescued from the apartment where the fire started. Firefighter/Paramedics provided initial treatment at the scene and transported the occupant to a local area hospital. Approximately 29 firefighters responded to the call. Damage from the fire was confined to one apartment. A preliminary investigation listed the probable cause as a smoldering cigarette left in a couch. Narrative: At 08:31 a.m. Tuesday August 25, 2009 Tacoma Fire Department (TFD) responded to a potential rope rescue in Puget Gulch near the Proctor District. TFD’s Technical Rescue Team responded but determined there was no need for a rope rescue. The patient had slipped the previous evening while walking on the gulch trail, sustaining minor injuries that prevented the patient from walking further. The next morning, another walker found the patient wrapped in plastic bags to stay warm. 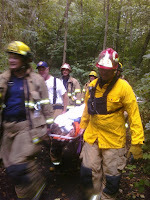 The patient was carried out along the trail in a Stokes stretcher and transported to a local hospital. For additional information call 253.255.3260. Narrative: Over the past two weeks the Tacoma Fire Department (TFD) has responded to a series of malicious false alarms and small fires at the Winthrop Apartments. Fire crews, residents and a sprinkler activation have contained 4 small fires in trash storage areas and in a laundry room and numerous pull station false alarms have frustrated crews and residents. The property management team has increased security and surveillance measures and the incidents are currently under joint investigation by the TFD and Tacoma Police Department. If you have any information regarding these incidents, please contact Crime Stoppers at 253.591.5959. Remove weeds and keep grass cut. Try not to place plants too close to structures and under overhangs or eaves. Provide adequate water to keep plants healthy and green. Trash and debris should be disposed of properly. If you have concerns about excessive debris on someone else’s property check with Tacoma Cares. Always dispose of cigarettes in ashtrays. Safely dispose of barbecue ashes. Incident Location: 2508 S. 76th St. Narrative: At 2:42 a.m. Wednesday August 5th, Tacoma Fire Department (TFD) responded to a reported residential fire at 2508 S. 76th St. The first arriving engine company found a fully involved detached garage fire with extension to a second seperate garage a crossed an alley. Crews controlled the exposure fire and protected the nearby houses initially and then concentrated their efforts on the main garage fire. The storage of numerous automotive parts and flammable liquids contributed to both the intensity and the degree of difficulty in extinguishing the main garage fire. Approximately 27 firefighters battled the blazes. The fire damaged two garages and several collectible automobiles. No injuries were reported. The cause of the fire is suspicious in nature and Tacoma Police Department has been called in for further investigation. Tacoma Fire Department was honored to be a part of numerous Neighborhood celebrations throughout the city of Tacoma last night. The 26th Annual event was designed to promote neighborhood spirit and heighten awareness to crime prevention efforts. Last year, over 37 million people participated in the event nationally. This year TFD was invited to 101 neighborhood events throughout the city during Tuesday night’s festivities. Thank you for all who helped makes it a great evening. Narrative: With a flurry of activity and shouts of encouragement, campers enthusiastically began their drill rotations this morning at the Tacoma Fire Department Training Center. Camp Blaze, hosted by Tacoma Fire Department and Seattle Fire Department attracts 16-19 year old females from across the United States. This years 24 participants got to try out several firefighter skills today, including climbing a 100 foot aerial ladder, repelling down a building out of a fourth floor window and cutting the roof off of cars with the “jaws of life” hydraulic tool. Campers are building their skills each day of camp, culminating in "live fire" exercises at the end of the week. Career female firefighters are serving as instructors/mentors for the week long adventure and their overall goal is to teach leadership skills, teamwork and provide campers with exposure to a potential career in the fire service. Narrative: On Thursday July 30, 2009, Tacoma Fire Department (TFD) resources were stretched thin as we responded to three reported structure fires in approximately 10 minutes this evening. The first fire was a reported kitchen fire, with the initial arriving companies extinguishing the minor cooking fire. The second reported fire was an apartment fire at 3931 Mason Loop Rd. Initial arriving companies found fire showing from the upper corner unit of this 4 unit building and initiated an interior attack and search and rescue. Approximately 29 firefighters fought the fire and protected adjacent apartment units. There were no injuries to report to occupants or firefighters. Red Cross is providing disaster relocation assistance to two displaced tenants. Thirdly, TFD responded to a reported residential house fire. The first arriving unit found a fully involved two story residential structure with the fire threatening additional structures. Approximately 25 firefighters battled the blaze and protected the adjacent house and garage. No injuries were reported. For more information please call 253.255.3260. Narrative: At 1:03 p.m. Monday July 27th, Tacoma Fire Department (TFD) responded to a structure fire at 1602 S. “G” Street – Hillside Grocery & Apartment, an approximately 3,484 sq ft 2-story wood framed mixed use building. The initial arriving companies found fire showing from the first floor of the structure and initiated an interior fire attack and search and rescue. Shortly after the initial interior fire attack, it was determined that the structural integrity of the building was compromised. A second alarm was dispatched and a defensive strategy was utilized. 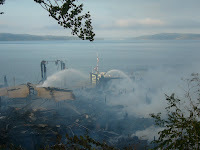 Approximately 60 firefighters fought the fire and protected the adjacent exposures. Ladders companies used aerial master streams and ground crews with hose lines fought the hot blaze. There are no injuries to report at this time. With record-breaking temperatures forecast this week, City of Tacoma libraries and Metro Park facilities are inviting people to drop in to cool off. These air-conditioned facilities and water based playgrounds can be valuable reprieve from the scorching heat. Infants and children up to four years of age are sensitive to the effects of high temperatures and rely on others to regulate their environments and provide adequate liquids. People 65 years of age or older may not compensate for heat stress efficiently and are less likely to sense and respond to change in temperature. People who are overweight may be prone to heat sickness because of their tendency to retain more body heat. People who overexert during work or exercise may become dehydrated and susceptible to heat sickness. People who are physically ill, especially with heart disease or high blood pressure, or who take certain medications, such as for depression, insomnia, or poor circulation, may be affected by extreme heat. Never leave infants, children or pets in a parked car, even if the windows are cracked open. When leaving your car, check to be sure everyone is out of the car. Do not overlook any children who have fallen asleep in the car. Avoid hot foods and heavy meals—they add heat to your body. Drink plenty of fluids and replace salts and minerals in your body. For additional information about extreme heat guidance visit the Center for Disease Control (CDC). Narrative: At 11:20 p.m. July 18th, 2009 Tacoma Fire Department (TFD) responded to a reported playground structure fire at Alling Park. When the engine company arrived they found a fully involved fire in the playground equipment. The crews quickly pulled an attack line and extinguished the fire. Based on fire scene evidence, TFD fire investigators have determined that the fire was intentionally set. The results of this cause and origin investigation have been forwarded to Tacoma Police Department for follow-up. Because the case is now under criminal investigation, no further information can be released by TFD at this time. If you have any information about this incident, please call Crime Stoppers at 253.591.5959. Narrative: At 2:51 p.m. July 22nd, 2009 Tacoma Fire Department (TFD) responded to a reported brush fire in the area of E 44th & E “T” street. The initial arriving company found a rapidly growing brush and tree fire and quickly called for a Brush Fire 1-11 (a designation for additional resources) upon initial size-up. Approximately 30 firefighters from TFD and Central Pierce Fire and Rescue battled the blaze in the heavy brush and timber area east of the Salishan neighborhood. The fire burned approximately 6 to 8 acres at is contained at this time. No structures were exposed to the fire and there are no injuries to report. Probable Cause: Undetermined at this time. Damages: Approximately 6-8 acres of grass, brush and trees. Dollar Loss: Unknown at this time. For more information please call 253-573-2588. Narrative: At 2:46 p.m. July 17th, 2009 Tacoma Fire Department (TFD) responded to a Hazardous materials spill at 2807 70th Ave E. A 540 gallon tote container of Isobutyl Acetate spilled releasing this commonly used solvent. The first in arriving engine was on scene within 7 minutes. TFD’s Hazardous-Materials crew’s diked the liquid from reaching storm drains, plugged the leaking container and used vapor suppressing foam to minimize the effects of any fumes coming from the product. The product was contained to the area of the spill – with negligible environmental impact. One business was evacuated during the incident and there were no injuries to report. Narrative: At 11:57 a.m. Thursday July 16, 2009 Tacoma Fire Department (TFD) responded to a rope rescue off of Marine View Drive in the Heron Ridge area. 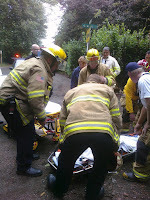 TFD’s Technical Rescue Team performed a medium angle rescue utilizing the Stokes stretcher to rescue the patient. The patient was transported to a local hospital. All Fireworks are illegal in the City of Tacoma. Violators of the fireworks law are subject to a $257 fine and the confiscation of their fireworks. Please call (253) 798-4722 to report violations (only use 911 to report emergencies). 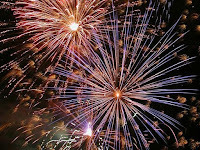 The Tacoma Police Department will respond to fireworks related call as units become available. We recommend you attend the Freedom Fair for a fantastic fireworks show! Finally, for all of you pet owners, prepare now for potential problems with you pets and the 4th. The Tacoma Pierce County Human Society recommends the following. Leave your pet home! Don’t plan on leaving him or her in the car. Home is safest! If you go out, keep your pets indoors at home in a sheltered, quiet area. Make sure there is nothing around that you pet could chew or that could hurt your pet. If possible, leave a television or radio playing. If you know that your pet is frightened of fireworks, ask your veterinarian about sedatives for your pet. Never leave pets outside unattended, even in a fenced yard or on a chain. Make sure your pets are wearing identification so that if they do become lost, they can be returned to you! On Monday June 29th, numerous residents of Fircrest stopped by to witness the training burn at 542 Electron Ave.
Crews spent several hours practicing sizing up the scene, how to make entry in to a burning structure, search and rescue, ladder techniques and firefighter accountability and safety procedures. The building is being removed to make way for additional parking for the "Tot Lot and Tennis Court facilities," and it provided firefighters with a valuable opportunity for on the job training. Thanks to all who stopped by and offered your support. Visitors young and old dropped in for for the fun and festivities at the Station #11's Centennial Celebration on June 27th. Many thanks to all of our neighbors in the McKinley Hill area for making the event such a great success and a special thanks to all of the retired Firefighters who added a special touch with their many stories from days gone by. 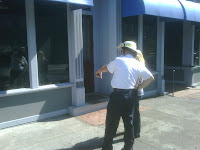 TFD Historian Ralph Decker provided an excellent pictorial tour of the station's history and Fire Chief Ron Stephens summed up the spirit of day best - "we look forward to serving this neighborhood for the next 100 years."